This is the story of the spice that changed the world, with 100 stuning recipes. 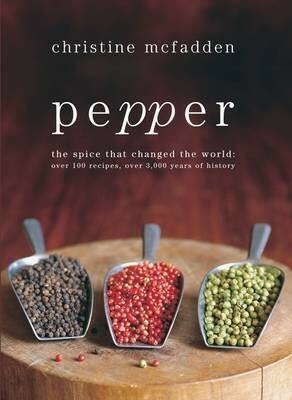 This is a book dedicated exclusively to the world's most valued and fascinating spice. Why is it that pepper and certain foods go together so perfectly? (Think steak au poivre, black pepper crisps, cream cheese and black pepper, or even strawberries and black pepper.) Christine McFadden's evocative collection of recipes from around the world are geared to modern lifestyles and informal eating, inspiring the imagination with unusual ways of using pepper - in cakes and desserts for example - reminding us of pepper's traditional use in pickles and preserves, in sauces and soups, curries and stews. A vivid first-hand description of the pepper gardens and spice markets of Kerala and a fascinating account of pepper's role in shaping history, provide a colourful backdrop to the serious business of cooking with and tasting pepper. The photography is by Jason Lowe. This work is following in the bestselling footsteps of "Cod and Salt".